Good morning all you lovely people, I'm running late today. First of all I am not going to show you my desk this morning, because as usual it is just a mess of scraps of paper which need putting away before I start on another project, instead I will just show you three cards I have finished over the past few days. However if you want to peruse some really interesting desks, go to Julia's wonderful Stamping ground, where you can look at lots. 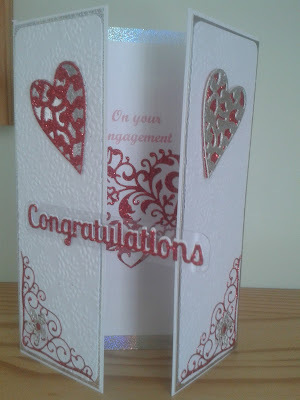 Suddenly all my friends daughters are getting engaged so a demand for Engagement cards made me realise that I have no 'Engagement' die so had to find a way of getting Congratulations and Engagement in two different ways. And the second, unfortunately trying to take a picture of holographic mirror card with a mobile phone was not very successful. 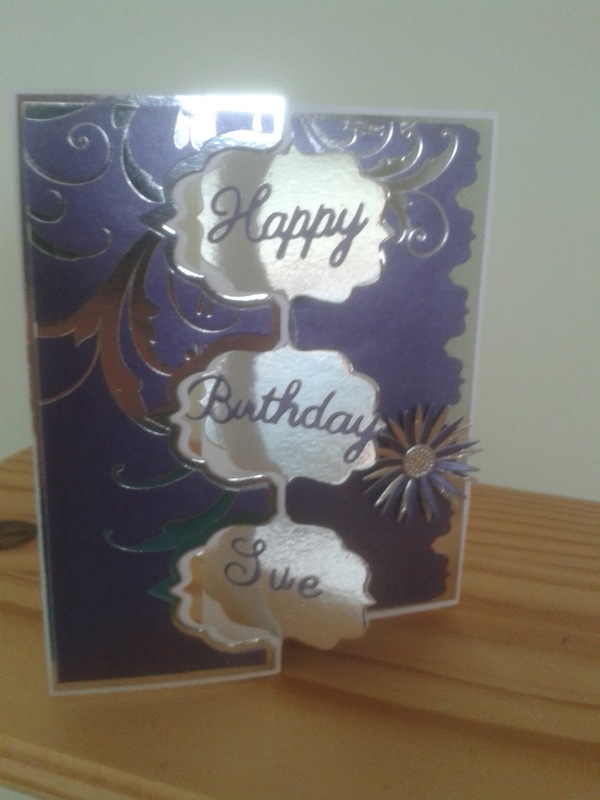 And this is a birthday card I made using Sizzix Framelits Die Triple Fancy Frame Flip-its. Again the mirror card making it hard to take a good picture. I bought the die set, because the information stated 'Design Dimensions 6 1/4" x 5 1/2"' which I assumed referred to finished card, and was very disappointed to find that that was the size of the card from which the design is cut and the final card is rather smaller, So having made this card for a friend, I then fiddled around with my existing dies to create the Engagement card. It is certainly easier and quicker using the set, but still quite fiddly. So now I'm going to visit some more interesting desks and maybe tidy mine so that I can actually do another Engagement card. Thanks for dropping by and I will try to get back to all those who leave a comment. Morning Chris. Thanks for the visit. The cards are great - can't quite believe those two young ladies are old enough to be getting engaged - I remember them being born. Oh, groan, how old does that make me??! Yes, John is feeling a lot better in himself, thanks. It is going to be a huge day out - but we decided it wasn't as far as a day in the Lakes, so was do-able! Mm Know what you mean about your word dies Chris as that is one area where I am very lacking also, funny, though - we never thought they were that necessary once. And die sizes can be annoying ie too big, too small, etc.. even though we get a ruler out and measure them when buying online, we can still get a surprise! 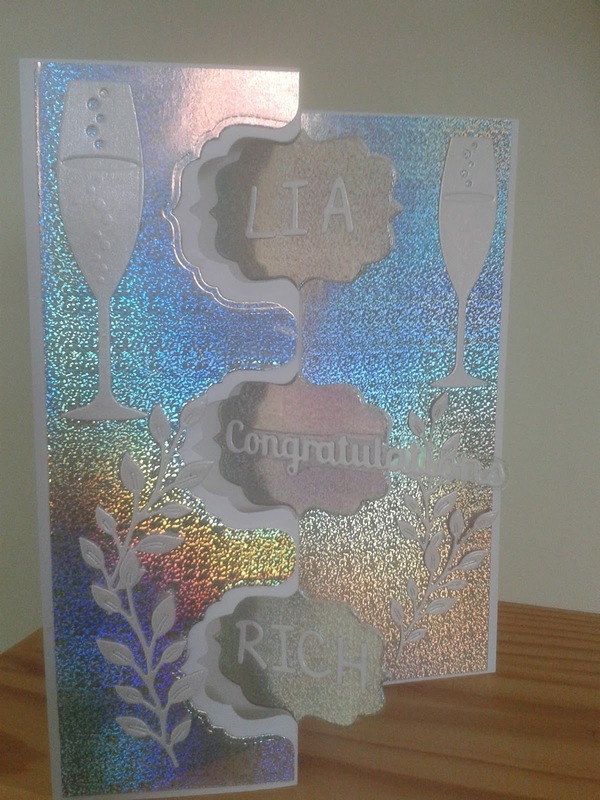 Wow, beautiful and professional looking cards - I love the fancy holographic and mirror card you've used, and that heart die in the top one is just gorgeous - definitely a case of die envy! your cards are so beautiful, love the die cuts in the mirror cards, stunning set, some one will be very pleased to receive them. Thanks for visiting me earlier. Lovely cards on your desk today. Wow, I am amazed at all the beautiful card makers! Your cards are gorgeous! Nice to see your blog and your happy work desk today! Happy Creating to you this week!! Very nice cards. I especially like the second one. Gorgeous cards. I particularly like the first one. Oh! Maybe that's where I'm going wrong....I never show the pile of papers so my desk looks not too messy. Ha ha...wait for next week!